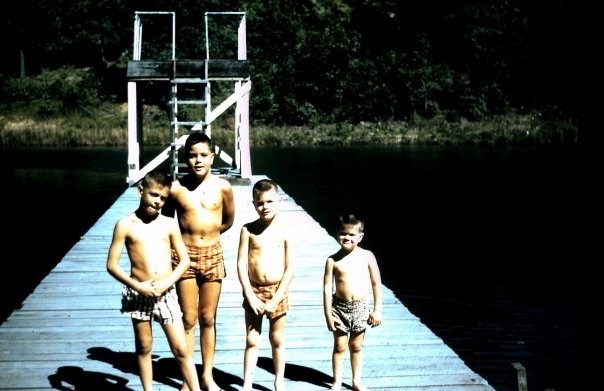 Fun at the Lake, the Mattingly Brothers, late 1950s. George, Ed, John, and Tom. Growing up, my sister and I were bookends to a guy bookshelf, the girly bread on a sandwich four-boys thick. It made for a rowdy childhood, a household full of mischief, especially for my sister as the oldest. At right, my brothers are boys again, enjoying a warm summer day in the north Georgia mountains. Originally a slide, (one of thousands my oldest nephew has tirelessly digitized), this photo is straight out of Mom’s attic. Of all the grainy, dog-eared images I’ve sifted through lately, this is one of a few that nag at me, keep me clicking back, again and again. 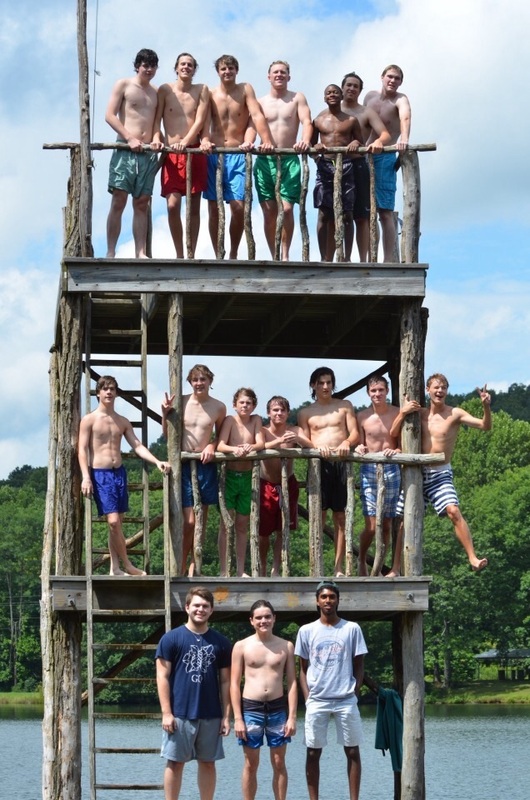 Westminster Men’s A Capella Retreat, 2015-16, at Tate Mountain, Georgia. When a week or so ago the photo at left popped up on my Facebook feed, I pulled the old brothers’ pic up yet again. The dock and dive tower, the distance to the far shore, the reckless joy of a summer’s day on the water struck a familiar cord. I’m pretty sure the setting is the same. 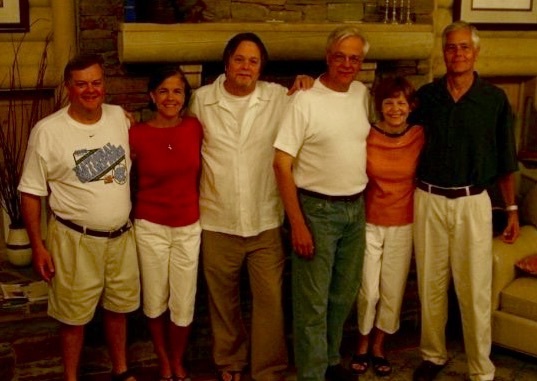 Now and then, our family tagged along when my uncle visited a friend’s summer home at Tate Mountain, Georgia. The dive tower has been rebuilt (though whether with safety or increased risk in mind is hard to say) without sacrificing the earthy primitive feel of this remote mountaintop retreat (It’s private, by the way, so don’t get any ideas). This coincidence of place, though it got me thinking, isn’t really the point. It’s the fresh faces, the body language, the endlessly varied expressions of these young men–even the ones I hardly know–that grip me. In part, it’s something shared, some deep boyishness in their bearing that plucks my heartstrings. I think of my own sons, young men now but still boys to me. I think of my father, who loved lake and ocean and waterfall alike, and most of all, I think of my brothers, those four guys I idolized as I grew up (even when they were needling me, calling me disparaging names, and later, ordering me to the kitchen for beer and snacks to enrich their football afternoons). 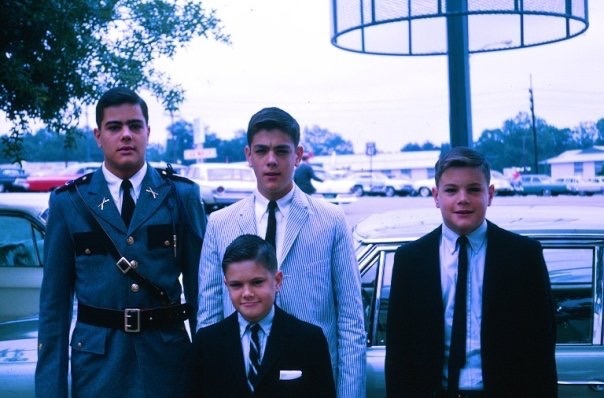 I didn’t know them when they were as young as the first photo depicts, but I swear I get a glimpse of the men my brothers were to become. In Ed, the oldest, there’s a certain vulnerability, an eagerness to please. I see the hesitant but dutiful Marine he would one day become. Next, George the renegade, slouching, planning his next move as he sizes up the photographer with a skeptic’s eye. Then John, his hands crossed so sweetly, a little aloof, always thinking. Finally, Tom with his wily grin, the youngest but always his own man, witty and confident. The brothers a little older. ROTC Ed at left. All students at the Marist School, Atlanta, the others would follow his lead. 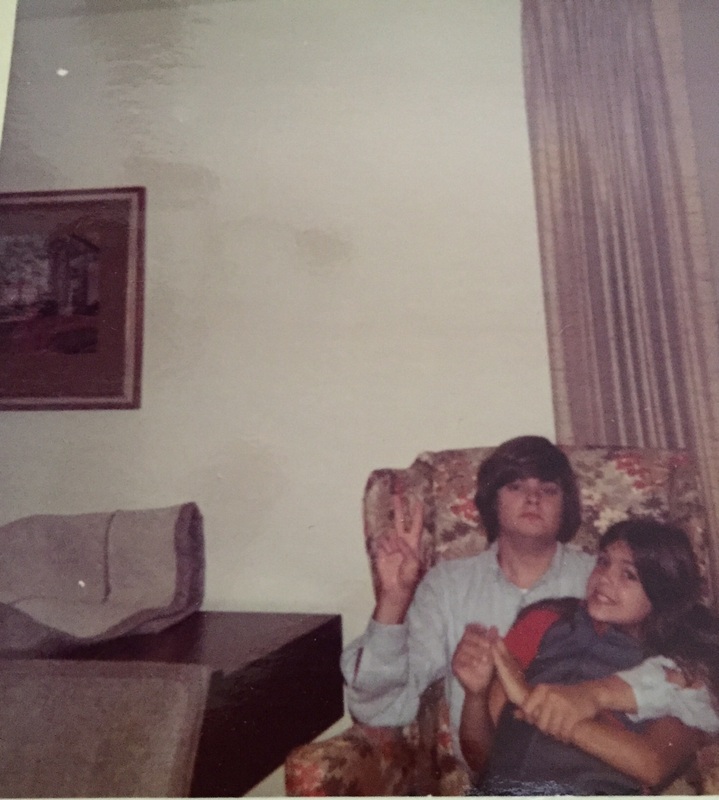 White Wall, with Son and Daughter, circa 1969. Note Tom’s steely grip and the terror in my eyes. Maybe I’m full of baloney! Maybe we just like to see ourselves, capture our requisite fifteen minutes (isn’t it more these days?) of limited fame so we can broadcast it to the cyber world. But I will say this. I’ve know some of the guys in the more recent Tate Mountain photo for years now, a few of them since they were kindergartners, and I get the same dizzying sense of deja vu when I see them here. There’s the kid who always made the moms laugh on the playground, just as playful now. And another, still gentle and wise and shy of his movie-star good looks, a third always cool, a little wary of what’s being asked of him. As for my youngest son–far left, second tier, blue trunks–I can’t quite put my finger on it, but something about his stance, that hand at rest on the railing, the muted smile, has been part of him since the day he was born. I’ll close with a PS snapshot of my brothers with my sister and me. They don’t look that different, do they? I mean their expressions, their essence, shine through. And what a comfort it is to see that Ed, whom we lost eight years ago, kept that boyish smile, the warm heart it heralded, right down through the years. Mattingly Siblings, 2005, Smithgall Woods. Rosie the Riveter got nothing on this chick. For days I’ve been stuck in my parents’ post-Pearl Harbor correspondence, adrift in an age shrouded in confusion and fear. Maybe this is what it means to be a time traveler—not whisking back and forth in a souped-up DeLorian (though that would be more fun, and cleaner), but suspended outside of time, one foot in this world and the other elsewhere. It’s a little like visiting a live Nativity, or a battle reenactment, only more heart-stopping. Just when you begin to lose yourself, to be swept into the dream, someone steps onto the stage cloaked in a persona you half-recognize, and Mon Dieu, it’s the person who raised you. 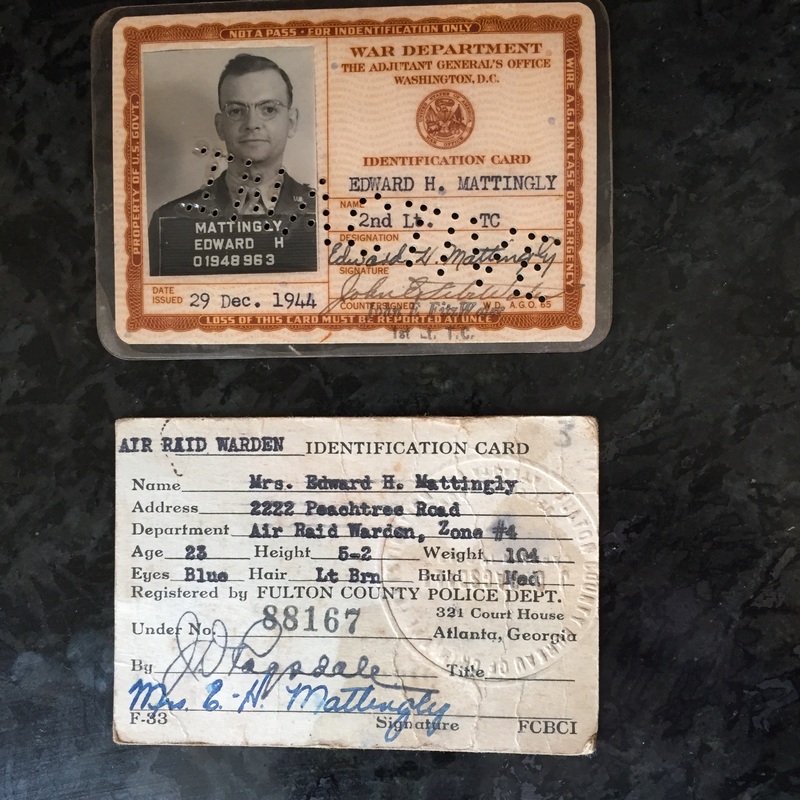 My father’s WWII ID card, December, 1944. He’d jumped from Private to 2nd Lieutenant by then. Pretty sure mom was a career Air Warden, and glad of it. Here, a photo of a young man who looks familiar (if you dressed him in tee shirt and ball cap, he could be one of my sons), and wow, it’s my father. There, a crumpled ID card. I examine the signature and discover that within half a year of her breezy, flower-strewn nuptials, my mother traded out her veil of ivory tulle for an Air Raid Warden’s helmet. 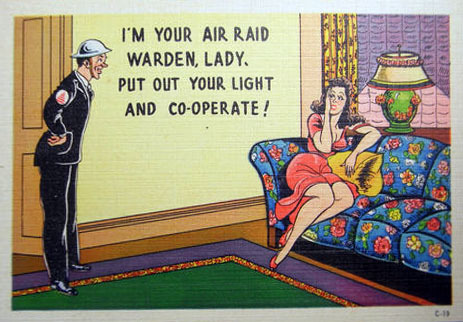 An Air Raid Warden? This is nigh on impossible. 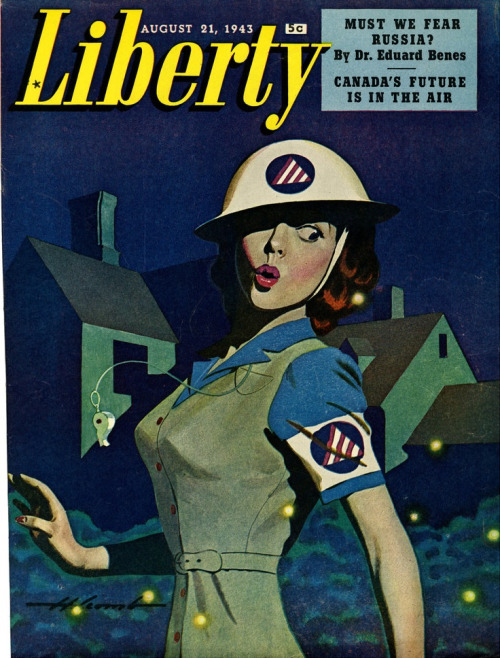 My mother, the belle of the ball, outfitted in khaki, with a whistle around her neck and a gas mask cinched to her belt? Glory be! I’ll have to ask her about this, I think, forgetting for a moment that she’s no longer in a position to answer. This happens often here in the attic. 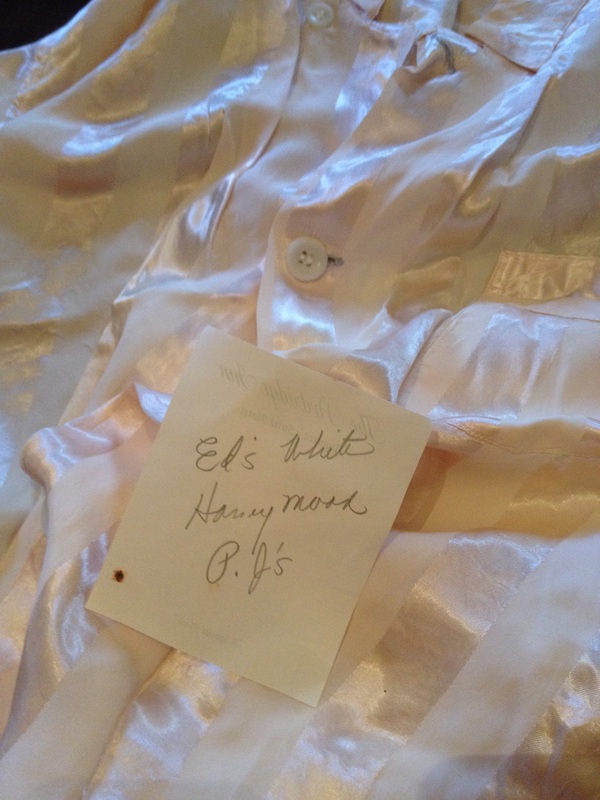 We find something that piques our interest (the egg carton stored in plastic, the vodka in a mayonnaise jar, my father’s silk “honeymoon pajamas”?!? ), and my heart tilts down the stairs to the den, where Mom ought to be perched in her favorite chair, enjoying her meatloaf and Chardonnay. 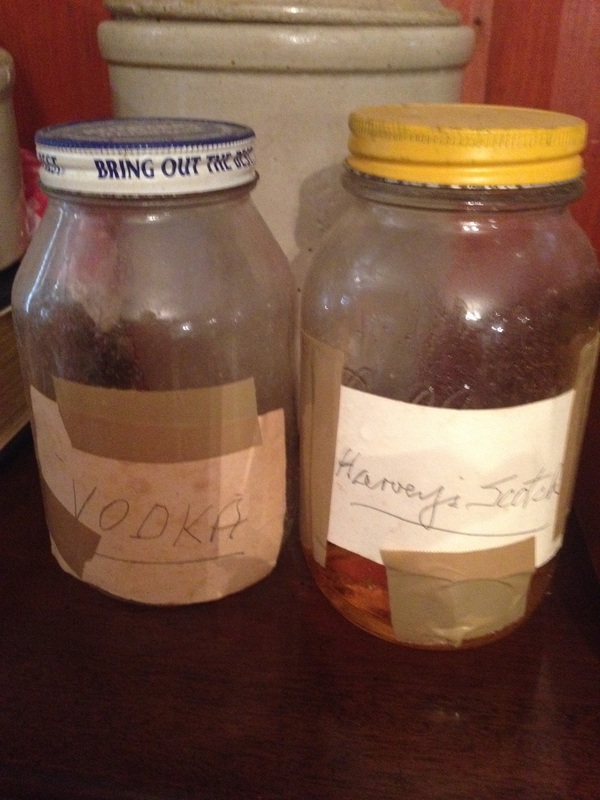 Vodka, and Harvey’s Scotch, labelled so by my father, who did not drink. If only we’d started this cleaning out business while she was still with us, you might say. If only, but alas, my mother wouldn’t have it. The very suggestion could bring her to tears. It was all my sister could do to toss the soured milk from the fridge during visits home. Uh, oh. Mom was a worry-wart, and somewhat prone to panic. Horses in shafts? In the streets of Atlanta, in 1942? When the warning sounds after dark, the blackout will be enforced. You will warn householders of any light showing and if it is not at once turned out or covered, report the fact to the nearest policeman. This is so not my mother! She was well-liked, yes, charmer of bus driver and boss man alike, but she could order a dog to steal a bone and it would run the other way. And at five foot two and 104 pounds, could she be expected to direct traffic, and corral large animals? In disbelief, I dig around some more and there, in a stack of envelopes held together with a limp rubber band, is a pertinent letter penned by my father in Atlanta, who had yet to receive his orders, to my mother, in Florida at a friend’s wedding. Dear Sweetie, I’ve just come from my warden’s meeting. My work as a warden is just beginning to interest me. Possibly it’s because I’m at last seeing the light–up until now I’ve had a very poor understanding of this war and our role in it. Perhaps in a few weeks I’ll begin to know what I’m supposed to do, but for now I’m sure of one thing–I’ve got to have an alternate warden, and there is only one person in this world I want as that alternate! Dad went on to point out my mother’s sweetness, reliability and strength of character. He was a persuasive guy, and sly like a fox, to coin one of his favorite clichés. I’ve found no evidence of my mother’s response, but the ID card is authentic, and dated June 1942, the same month as Dad’s letter. In fact, it’s dated before the postmark on the letter. I believe my father presumed, as he was wont to do. I imagine Mom didn’t much like that. I feel for her. The ink on their marriage license was hardly dry, their first apartment still lacking curtains–who knew what would be asked of them next? Many of her friends’ husbands had been shipped off. My uncle was about to be deployed to France. I’m sure Mom bucked up. I bet she kept those khakis starched stiff, and her whistle polished to a sheen.